Tragically, between one and two children die in Australian homes every year as a result of non-compliant corded blinds and curtains. Similar deaths occur regularly across the world and the ACCC is joining international regulators to warn of the hidden dangers associated with corded blinds and curtains. “Loose cords can be extremely dangerous to young children, as they can quickly tangle or loop around a child’s neck. We are urging parents and carers to check each room in their house for blinds or curtains with cords and tie them up with cleats,” ACCC Commissioner Sarah Court said. “Young children will also climb on furniture, such as chairs and couches that may be near windows with blinds or curtain cords. All cords throughout the house should be secured and out of reach of children,” Ms Court said. The mandatory standard for internal window coverings was declared in July 2010 and a separate regulation relating to installation services of window coverings came into effect in January 2015. In April, the ACCC conducted a survey of corded blinds and curtains in 131 display homes and found evidence of an alarmingly poor level of compliance with the regulations for both supply and installation of window coverings. Had the homes been sold with the window coverings as installed, only 10 per cent would have complied with all the requirements of the mandatory standard, including the incorporation of cord guides, cleats to keep the cords out of harm’s way, installer details, and mandatory warning labels. “The ACCC is putting suppliers and installers on notice that they face prosecution and fines of up to $1.1 million if they fail to comply with the regulations,” Ms Court said. The ACCC will continue to educate housing companies, manufacturers, retailers, and installers of corded internal window coverings about the requirements of the mandatory standard. The ACCC will be undertaking further surveillance and enforcement action will be taken where serious breaches of the regulation are found. When installing new blinds and curtains, make sure you or the installer secure any loose or looped cords—do not leave them hanging down. Go through every room in your home and check for any blinds or curtains with long cords that are either loose or looped. Remember, this includes any cords that are within children’s reach at floor level or near furniture they can climb on. Do not put children’s cots, beds, highchairs or playpens near a window where children can reach blind or curtain cords. The cords can become tangled around children’s necks and strangle them. Do not place sofas, chairs, tables, shelves or bookcases near windows with corded blinds or curtains. As young children like to climb onto furniture to look out the window, they may quickly become entangled in the cords, lose their footing, and suffer strangulation or serious injuries. Accidental strangulation can happen very quickly, so never leave children alone in rooms where cords are unsecured if you’re visiting someone’s home, even for a short while. tension devices that enclose cords and chain loops. 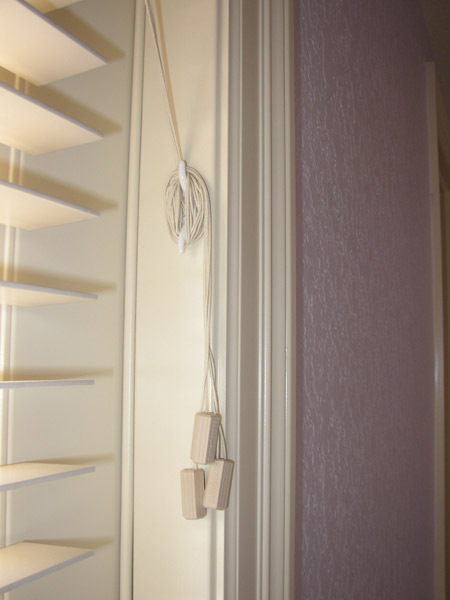 Always fix tie-downs and tension devices firmly to the wall or window-frame so a child is not able to remove them. Never use materials that can’t support a significant load, such as double-sided tape or glue. Consider replacing corded blinds and curtains with cordless alternatives. There are safer designs of window coverings available for most applications.